There’s something incredibly satisfying about treating yourself to a decadent homemade dessert after devouring a savory entrée. But what makes eating dessert even more of a sensory-pleasing experience is by pairing your sweet treat with the perfect wine. Just like pairing red or white wines with flavorful entrées to enhance the flavor, when paired correctly, wines and desserts emphasize each other’s flavors. When thinking about which wines will pair well with which desserts, it’s useful to consider the tastes found in desserts. Additionally, there are three components of wine to consider before settling on a pairing: acidity, sweetness, and intensity. Measured by pH levels (wines usually range between 2.5 and 4.5), acidity gives wine its tart and sour taste, which influences the puckered sensation you feel on your palate after sipping wine. While wine acidity is quite complicated, it’s an important aspect of wine because it influences taste and tart perceptions. The common acids found in wine are tartaric, malic, and citric acids. Because white wines tend to be more acidic than reds, white wines with higher acidity such as a Chardonnay or a Moscato pair well with fruity desserts such as fruit cobblers and apple tortes. The sweetness of wine ranges from extraordinarily sweet to semi-sweet to dry and completely dry. A wine’s sweetness also reduces the acidic sensation as outlined above. While our senses play a key role in our perceptions of taste, our sense of smell greatly affects our sense of sweetness. Sweet, luscious wines such as Ports compliment sugary desserts like milk chocolate-based treats. For vanilla-based sweets, a tangy Chardonnay or a late-harvested Riesling provide a balanced sweetness that enhance the buttery flavor of vanilla. Intensity is one of the most alluring traits of a high-quality wine. While intensity is made of several key traits, wine intensity can be measured by tannin (a naturally occurring polyphenol found in fruit skins) levels on a scale representing light wines to bold wines. In essence, a wine’s color reflects its intensity. For example, a full-bodied red wine such as a Shiraz will have a higher intensity and higher alcohol content than that of say a light-bodied Pinot Noir. 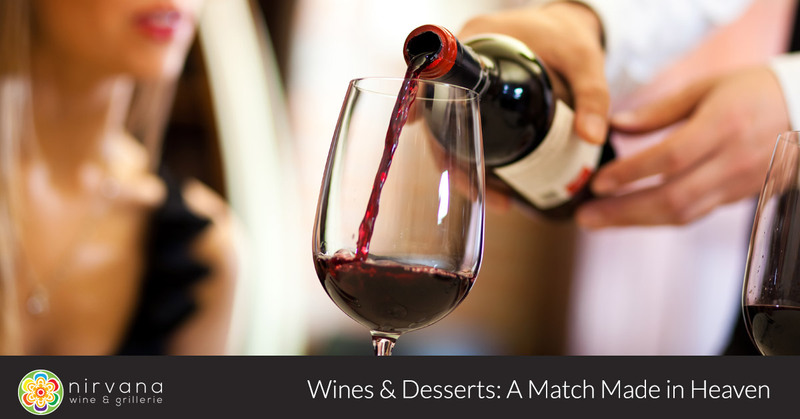 More intense wines pair brilliantly with richer desserts. For instance, the deep notes of a dark red Merlot matches wonderfully with a rich, chocolaty brownie. For decadent dark chocolate cake, try a Cabernet Sauvignon. Along with knowing the key components and fundamentals of wine, there are few helpful guidelines to follow when pairing wines with desserts. First, keep in mind that wine should be as sweet, if not sweeter, than the dessert it is paired with. Also, match the weight of the wine you want with the weight of the dessert. This is especially essential when pairing sweet treats with richer, sweeter wines like ports. You’ll want to balance them so that one doesn’t overpower the other, instead working harmoniously together to enchant your palate. Lastly, consider the respective wine and dessert flavors, as well as the textures, so that these aspects come together effortlessly, stimulating the senses which heighten the tasting experience and satisfy the soul. At Nirvana, we want to provide you with a long-lasting experience that blends pleasurable wines with delightful flavors found in our carefully-crafted from-scratch dishes and mouthwatering desserts. We believe that pairing delectable tastes, flavors, and textures of tasty foods and alluring beverages greatly enhances the overall dining experience every time you come in. Find your nirvana by visiting us at our Vernon Hills wine bar and grillerie for a most memorable dining and drinking experience.